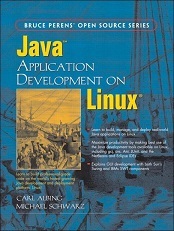 Written for Java and Linux developers alike, Java� Application Development on Linux�is the hands-on guide to the full Java application development lifecycle on Linux. Determined to spare other developers hours of trial and error, Albing and Schwarz demonstrate the platform, tools, and application development by showing realistic, easy-to-follow examples. After a simple command-line application introduces basic tools, this program leads readers through business-logic object analysis, database design, Java servlet UIs, Java Server Pages (JSP) UIs, Swing GUIs, and Standard Widget Toolkit (SWT) GUIs. Scaling up to the enterprise level provides the opportunity to use both the JBoss Application Server and the Apache Geronimo Application Servers, and Enterprise JavaBeans (EJB). Will Iverson has been working in the computer and information technology field professionally since 1990. His diverse background includes developing statistical applications to analyze data from the NASA Space Shuttle, product management for Apple Computer, and developer relations for Symantec's VisualCaf�. For nearly five years, Will ran an independent J2EE consulting company with a variety of clients including Sun, BEA, and Canal+ Technologies. He currently serves as the application development practice manager for SolutionsIQ. Will lives in Seattle, Washington.